I purchased my home over 11 years ago and it’s under 1000 ft. which means I have to be really creative with storage and I also have to be really conscious about half of the items that I bring it to my home. It’s so easy for my home to get cluttered especially during the winter months. Since living in this home. I've actually never created a spring cleaning list. I've created different projects. But never a list of items that I would like to work on and clean. 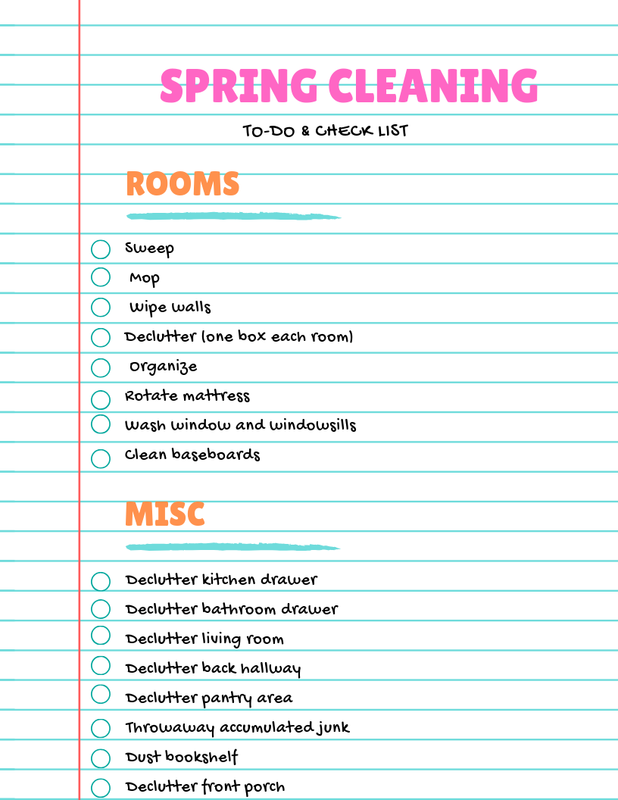 I’m sharing a list of some of the items that I will like to clean this spring. Do you plan on spring cleaning this year? Thank you so much for the check list I really need to think about trying to get my spring clean on and getting the whole place looking a lot more clean and tidy. This is when I pull the rugs, clean the window sills and other cleaning projects I don't do regularly. I love to do my porch, and using the powerwasher is so much fun. It is time to start taking one room at a time and spring cleaning. I have started doing some spring cleaning and organizing. I REALLY need to get started on mine. Baseboards? I dont' think I've cleaned them since moving in. I'm thinking of cleaning AND painting them! I need to print this out. I always forget some of these, like rotating the mattress. That check list will come in handy. I really need to do a big Spring clean at home. Might have to rope the kids in to help declutter their room. oh yes ill be checking off a few of these things today to get it OFF My list ha- love spring cleaning and all the things to get done- i may just bribe my kids to help too! This is such a helpful list. Yes, I do need to Spring Clean. Will I actually do it? Well, that remains to be seen, I guess! Spring cleaning is definitely one of those chores that I don't necessarily look forward to. Alas, it must get done. This is a helpful list!! I was just talking about buying containers like this for our pantry. I need to organize it! I'm not a fan of spring cleaning, but I always feel better when my house is in order. This list is a good starting point for me. Oh wow! I love spring cleaning and you showed the best list. I need this list and clean our rooms!! My favorite time of the year is spring because I love to do spring cleaning!! Yes, I'm weird like that but living in Florida with all the yellow pollen every where and I mean every where, everything needs to be cleaned after that. Indoors and out. Great list! I will soon do this in our house. It's so hard to start it. ha! Thanks for sharing your checklist. It reminded me to rotate our mattress and wipe the walls. I definitely need to do some spring cleaning. I don't have a lot of stuff, for me less is more, but I do like doing a good deep cleaning every once in a while. Spring sounds like the perfect time to do it! Yes! We have a major Spring cleaning project at our house!